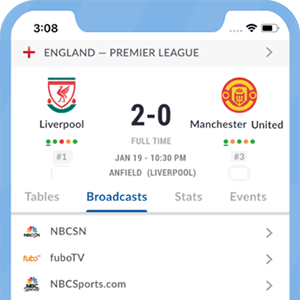 The data we collect from users of Live Soccer TV site will be used to allow us to inform you about Live Soccer TV News and Updates, as well as to notify you of issues, events, or special offers we believe may be of interest to you. By signing up to our email list, you are giving Live Soccer TV permission to contact you by e-mail. Live Soccer TV uses reasonable precautions to keep the personal information disclosed to us secure and to disclose such information only to third parties we believe to be responsible. However, we are not responsible for any breach of security or for any actions of any third parties which receive the information. Live Soccer TV may also link to a wide variety of other sites. We are not responsible for their privacy policies or how they treat information about their users.